Aside from children’s school uniforms, Children’s World also houses a plentiful supply of toys and games. During Thanksgiving, moments of gratitude and family-time are sprinkled in throughout a multiple-day binge of consumerism. Large corporations, through the retail holiday Black Friday, have included a national spending spree within the traditional cornucopia. This post-turkey feast of material gluttony has recently skyrocketed in popularity, resulting in companies extending their sales for up to two weeks as a way to kick off holiday spending. However, a movement called Small Business Saturday has also gained a following since it was started in 2010. Largely backed by credit-card company American Express, Small Business Saturday encourages citizens to shop local and give back to their community instead of supporting the large retail companies. Local businesses around the country work with American Express as “Neighborhood Champions” to rally fellow businesses to participate in the movement. 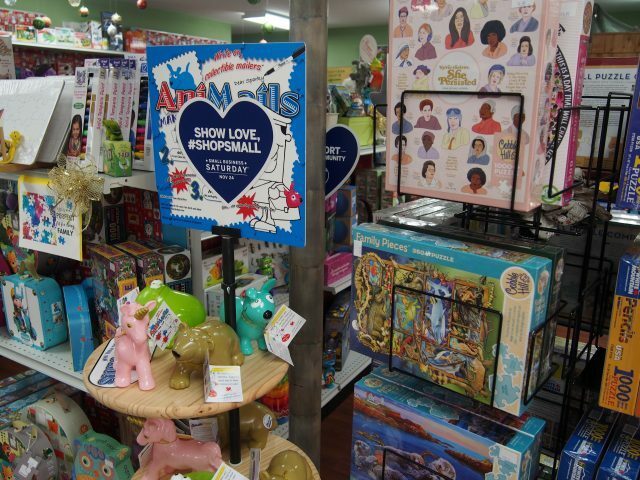 Children’s World, located near Interstate 75 off of Bee Ridge Road, has participated in Small Business Saturday since the event first started eight years ago. 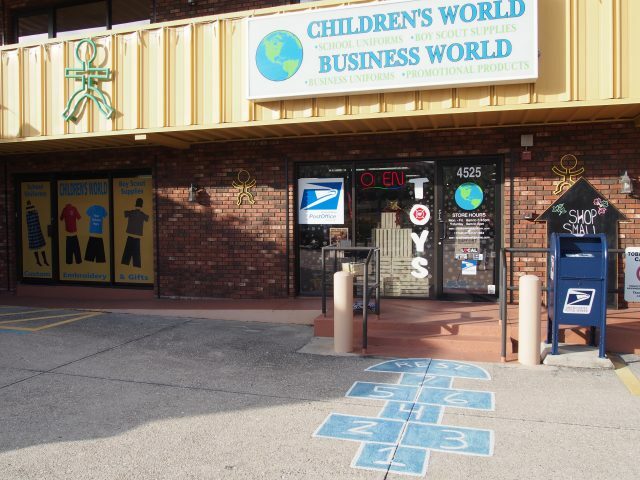 Tim Holliday, co-owner of Children’s World, has helped Children’s World obtain the “Neighborhood Champion” title from American Express. Each business with that designation receives promotional items from American Express and helps distribute those items to other small businesses in Sarasota. 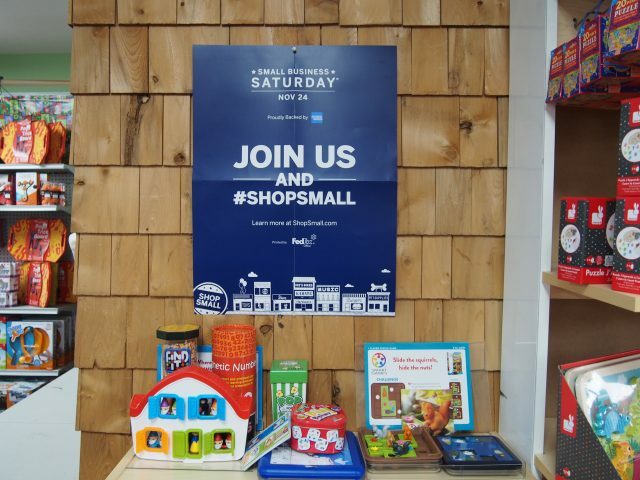 Companies like American Express and FedEx encourage shoppers to participate in Small Business Saturdays through posters like this one. “It’s always been amusing to me that American Express started this whole thing,” Holliday said. Holliday did not initially consider that a nationwide credit card company like American Express would support this type of event, but after years of monetary backing through television and radio ads for Small Business Saturday, American Express gained Holliday’s respect. Holliday advocates for Small Business Saturday because he believes in the importance of supporting small businesses. According to data from the United State Census’ Annual Survey of Entrepreneurs in 2016, the majority of the 5,601,758 firms with paid employees consisted of small businesses: firms with 499 employees or less. Holliday feels that Small Business Saturday shines the spotlight on these local businesses who rarely get the attention during the holiday shopping season, especially in Sarasota. Located off of Bee Ridge Road, Children’s World’s entrance previews its children-friendly appeal with hopscotch and miniature figures reminiscent of Tube Dude. Children’s World partnered with Sarasota Rocks to hold a six-hour event at the store on Nov. 24 where people in attendance could paint small rocks while shopping at Children’s World. Sarasota Rocks, a group working as a branch of the Global Kindness Project, facilitates events where individuals can paint rocks and hide them in different places around the community. 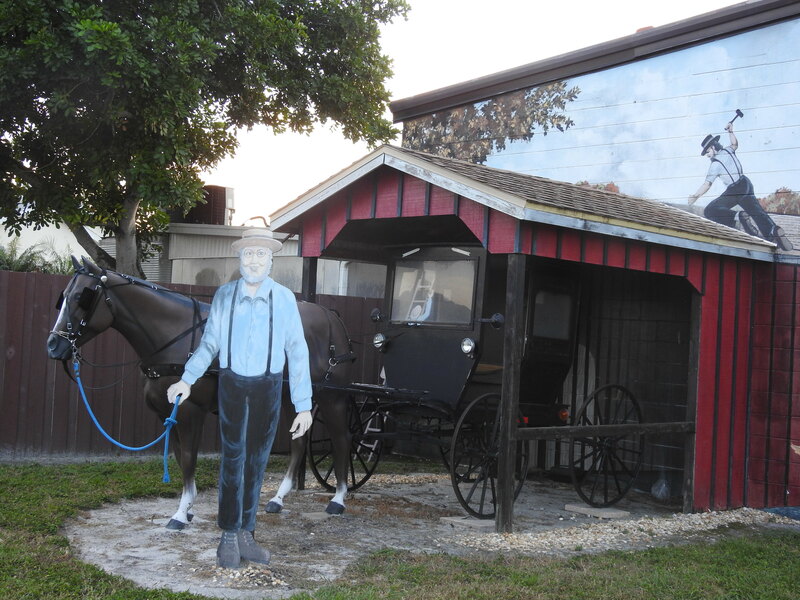 Whenever somebody finds a painted rock, they can take a picture of the rock and post that picture on social media, tagging Sarasota Rocks in the process. With these activities, Sarasota Rocks hopes that they can cause someone to experience a brief moment of joy and create a sense of community at the same time. Holliday wanted to incorporate this event into Children’s World’s Small Business Saturday plans because he believes that local businesses play a role in fostering community bonds. Holliday also feels that the large retail corporations, or “big box” as Holliday calls them, lack the unique aspects which help create a sense of community. 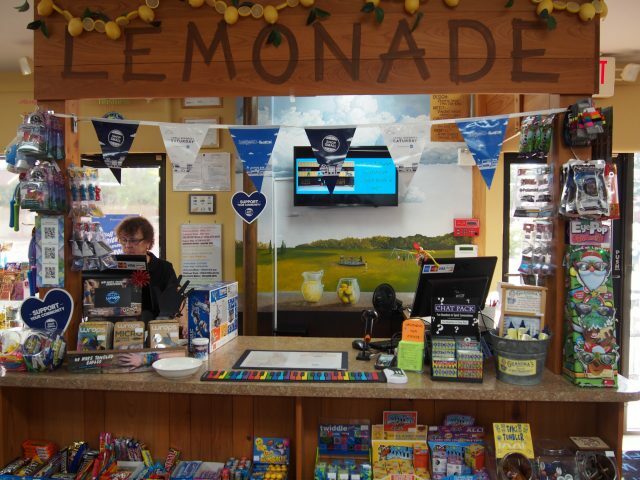 Children’s World customers can purchases at the lemonade stand, here adorned with Small Business Saturday decorations. While Small Business Saturday encourages consumers to shop local for one day during the Black Friday craze, Holliday feels that people in Sarasota could do more beyond a single Saturday to support small businesses. “In my dreams, I hope that someday something will lever off of Small Business Saturday to become [for example] “Small Business Sarasota” or something, and be more than just one day,” Holliday said. Information for this article was gathered from americanexpress.com, childrensworlduniform.com, visitsarasota.com, the United States Census Bureau and the Sarasota Rocks Facebook page.